Generate Fake Instagram Chat and prank your friends by sharing the generated image by our Generate Instagram Chat Tool. Upload profile picture, make a screen-shot as you like with our tool and astonish your friends. Use our Fake Instagram chat Tool and prank your friend on all social media platforms. It’s easy to use and very simple, but having latest Twitter layout and design as well as icons and buttons. 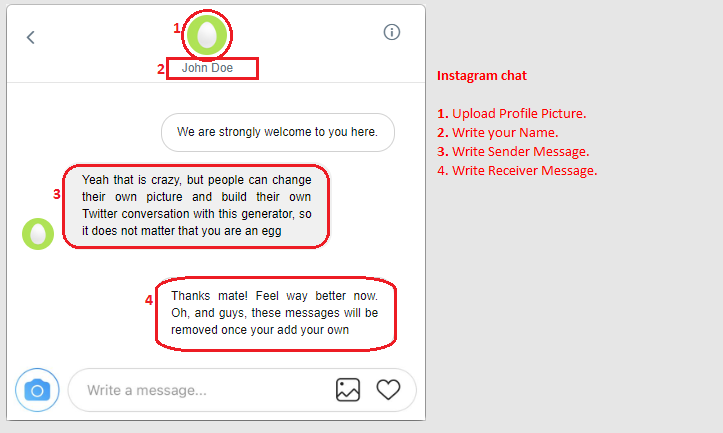 How To Generate Fake Instagram Chat? On my IOS phone, generated image is not good 🙁 help.. I reallky like your website and its really helping me personally. looked alll round the web and found this site Powerlikes. accoount and go viral. Its a very new to myself.